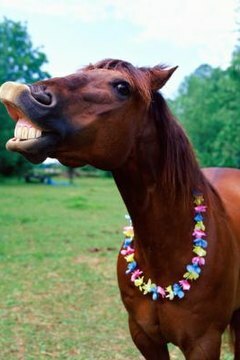 Sometimes a horse's teeth grow unevenly, creating dental problems that can lead to difficultly eating and weight loss. Equine dentists can file down the teeth to make chewing easier and remove problem teeth by extracting them from the horse's mouth. Equine dentists need an assortment of equipment to perform dental work on a horse. The term "floating the teeth" refers to the process of filing down the rough, uneven parts of a horse's molars. Filing down uneven teeth allows the horse to chew more easily and comfortably. Equine dental floats are long handled files that are designed to be inserted in the mouth and can reach all the way to the back molars. Power floats are mechanized versions of the traditional float, using a machine to perform the filing motion that the traditional float requires the equine dentist to perform by hand. An equine mouth speculum is designed to hold a horse's mouth open while an equine dentist works on the teeth. The speculum is a metal device held on the horse's head with a bridle-style adjustable headstall. The speculum is made of metal and placed between the horse's top teeth and bottom jaw. The hinges on the speculum adjust how far the horse's mouth is open. Equine dental forceps serve to remove teeth from inside of the mouth. These are most commonly of use for pulling problem teeth or for removing a horse's wolf teeth. Slightly different styles of forceps are specially tailored for removing molars or extracting fragmented teeth. It is normal for an equine dentist to wear a light on top of his head when performing equine dentistry. The light shines into the mouth as the dentist is looking into the mouth and allows the dentist to see what he is doing. Long handled mirrors can also be used to help an equine dentist see exactly what he is working on inside your horse's mouth. Equine dentists will also use basic medical supplies such as veterinary grade sedatives, disinfectants and antibiotics in the event of a tooth abscess or infection. Many equine dentists are also licensed veterinarians who can legally access and prescribe sedatives and antibiotics. About Your Horse: What Does Floating Teeth Mean & Why is it Necessary?